Are you sending potential new customers to old content on your blog that is out of date? ….do you have old content on your site that never gets any traffic? Both of these things are bad for your site, so you need to do something about them. And here’s why. Producing new content on a regular basis may not always work as you would expect it. A lot of blog content simply doesn’t generate ongoing traffic from Google search. This is why the most popular and high traffic blogs on the Web focus on quality over quantity. The Pareto principle applies to blogging as well, meaning that 20% of your articles will produce 80% of your traffic. So it makes perfect sense to make the most out of your older, popular blog articles. Go through your Google Analytics reports and look for articles that generate a lot of traffic and make a list of those that you published some time ago. Review each of the articles on your list and check if anything has changed from the moment it was published. If your older traffic-generating content is outdated, then you’re not providing your audience with relevant information. If the older blog content is not getting any traffic, you need to do something about it e.g…. Keep on reading and I’ll tell you what to do and when! Now that things are changing faster than ever before in almost every industry, you need to make sure those changes are reflected in your content as well. By updating your content on a regular basis and republishing it, you’ll be doing yourself and your audience a big favor. 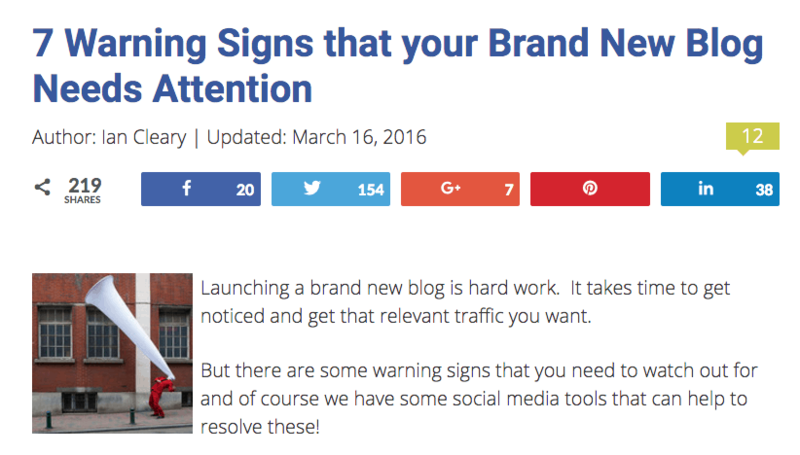 You also probably have content on your blog that’s not worth updating at all. Digital Marketer reduced the number of posts on their site by 900 last year by performing what they call a “smell test.” They looked at the number of posts with more than one organic visit in the last 90 days. They labeled the posts that didn’t get a single visit from search engines in the last 90 days as “stinky content,” and removed almost 900 posts from their blog! They kept only content that people already loved, improved and updated it, which resulted in huge bumps in traffic to their website. So think about removing your non-performing content from your blog and focus on republishing the older posts that are getting a lot of traffic. The following post was visited twice on my site over the last 90 days. The content is old, out of date, and because I wrote it a couple of years ago, the quality could be a lot better. 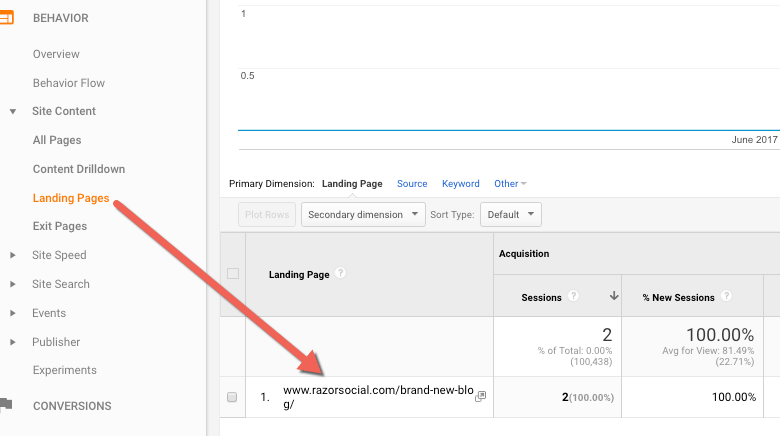 You can find these posts by setting a date range in Google Analytics to the last 90 days and looking at the landing page section. I don’t republish all the articles on my site that need to be updated. Some of them require only minor updates so it doesn’t make sense to republish them. But if I make significant changes to the original article, I’ll change the publish date to the current date and republish it as a new post. Typically, I’ll mention at the beginning of the post that this is an updated content. The important thing to note here is that you shouldn’t change the article URL. 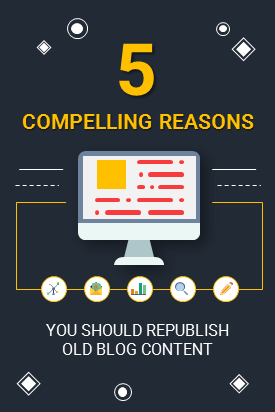 If you do, you’ll lose all the benefits of republishing. All the backlinks for that article will be gone and you’ll lose a lot of traffic due to broken backlinks. When someone finds your blog post through a Google search, they’ll get a bad impression if the content is outdated and irrelevant. They’ll leave your blog immediately since you didn’t give them a reason to stay and further explore what you have to offer. This is not the image you want your target audience to have of you. Put in some work to make sure you are providing your visitors with fresh content, regardless of when it was first published. In some cases, your older articles will need a few small changes to stay fresh which means you’ll just need to update them without republishing. But if you’re making significant changes, it makes perfect sense to republish and then promote the article to get more eyeballs on it. 2.Your article is ranking on the second page of Google. More than 90% of people do not click past the 1st page of the Google search results. Imagine how much traffic you’d be missing out on if your content ranked at the top of page 2! By updating, republishing, and promoting the content, you’ll get more shares and more links to your article which means you have a good chance of pushing it onto page 1. If you leave it as it is, your chances of improving your content’s position in search results will only go down due to the constant flood of new and relevant content published by your competitors. If your content is not out of date you might just optimize it a little bit for SEO. 3.It is a type of article that you periodically update. If you are writing about a topic that is prone to changes, you should update your article regularly to reflect those changes. For example, if you are writing about social media tools, with so many changes happening in that space you’ll want to make sure your content is regularly updated. There are new tools coming out every day and old ones are changing as well. You don’t want people on your blog to read about the tools or features that no longer exist. Three years ago I wrote an article about best tools to use for Twitter chats. This was a very popular article at the time, but more importantly, it continued to bring traffic to my blog. Since it was published, some of the tools changed in their functionality, one closed, and new tools appeared that were even more useful. I removed information that was no longer relevant, added new tools, and republished it. So now, when people find it through Google search, they’ll get up to date information about best Twitter chat tools. 4.It is a valuable post you want your new audience to see. If you have a really important article on your blog that is a couple of years old but it effectively convinces your audience about the value you can bring to them – republish it! Even if the content is not outdated or irrelevant, by republishing it you’ll get a whole new set of eyes on the content. Of course, you can look for ways to make the article better, like improving the images within the post or adding more content. You probably have more experience than when you wrote the post, so why not use that to your advantage? 5.To take advantage of Google algorithm changes. Over the last couple of years, Google made a significant change to its algorithms, moving to a more semantic analysis of your content. The search giant isn’t just focused on looking for exact matches of certain keywords in the content. Now it’s trying to understand what the content is about. This means that you should focus more on a topic as opposed to keywords. 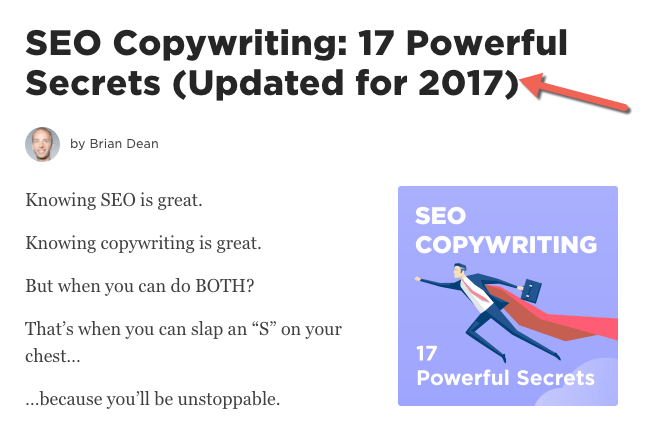 You’ll still optimize your content for particular keywords, but you won’t use those same keywords over and over in your content. You’ll use related keywords and synonyms instead. Adjusting your old posts to this algorithm is a smart thing to do if you’re counting on good ranking in search results. If you’d like to learn more about different ways to deal with outdated blog content, I recommend you watch my video below. I think you’ll find the tactics I share very useful! If you have high-quality out of date content that is generating a lot of traffic to your website, don’t leave it as it was when you first published it and hope for the best. Revisit it on a regular basis and see what you can do to make it even better and more useful to your audience. Are you republishing your old content? Would love to hear from you in the comments about the results you’re getting!